Last weekend we threw a Friendsgiving party where we had a bunch of people over and everyone brought their favorite Thanksgiving meals. We made Cheesy Green Bean Casserole along with a pumpkin cheesecake, Sous Vide Eye Round Roast and of course fried turkey! Last post I discussed prepping the turkey and this time I’m going to go over brining. This is an essential step if you really want a moist, flavorful turkey. I think it also goes really well with frying. The end result is perfectly moist turkey with a crisp crust. The frying really seals in the moisture throughout the cooking process. 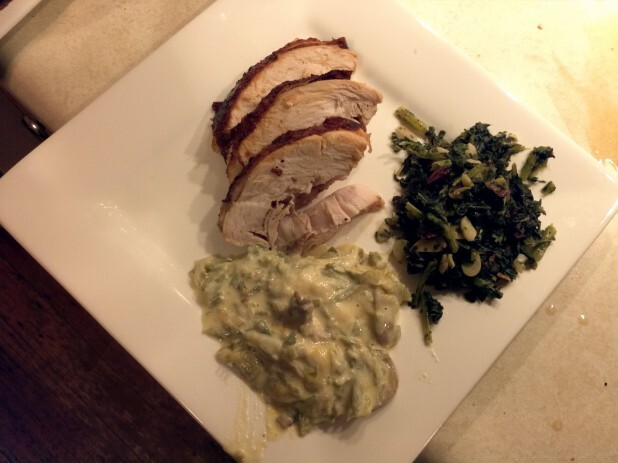 Above the turkey is plated with the Cheesy Green Bean Casserole and some kale. 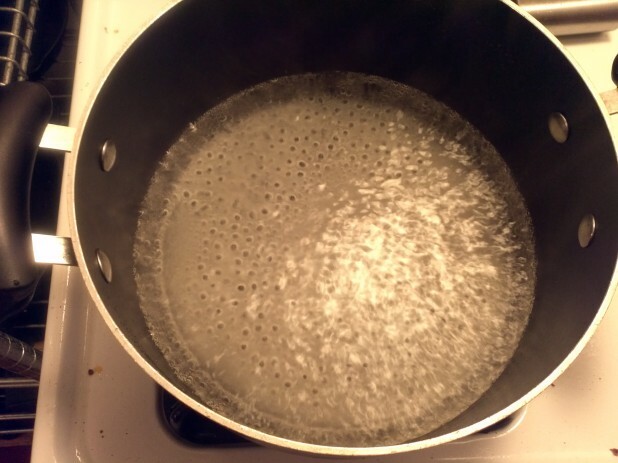 The basic method for creating a brine is to boil a subset of the water, add the granulated ingredients and then stir to dissolve. The main ingredient of the brine is Kosher Salt. For this recipe I used 1 cup of salt and 2 Tbsp of black pepper. Many recipes also involve adding sugar but you will have to decide if that works or not for your keto diet. Its questionable if much of the sugar gets absorbed into the meat or not. Here is the dissolved, concentrated brine. This liquid is hot and you are going to be refrigerating the turkey in the brine for 24 hours. So, you need to cool it down with more water. 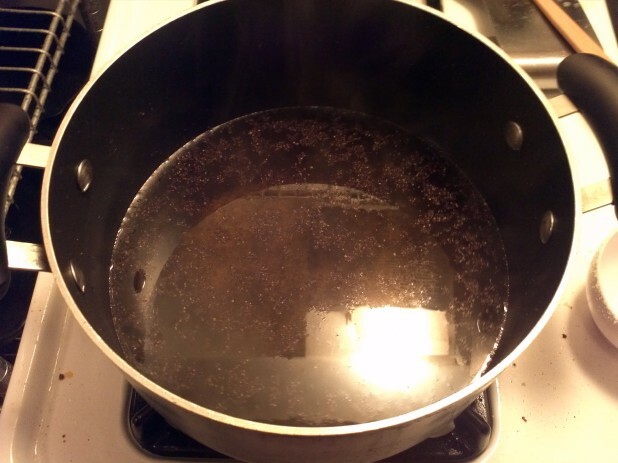 Only use the amount of water needed to dissolve the salt, say 2 cups. Here is the brine with more water added. Now it is pretty close to luke warm and we can add it to the turkey. 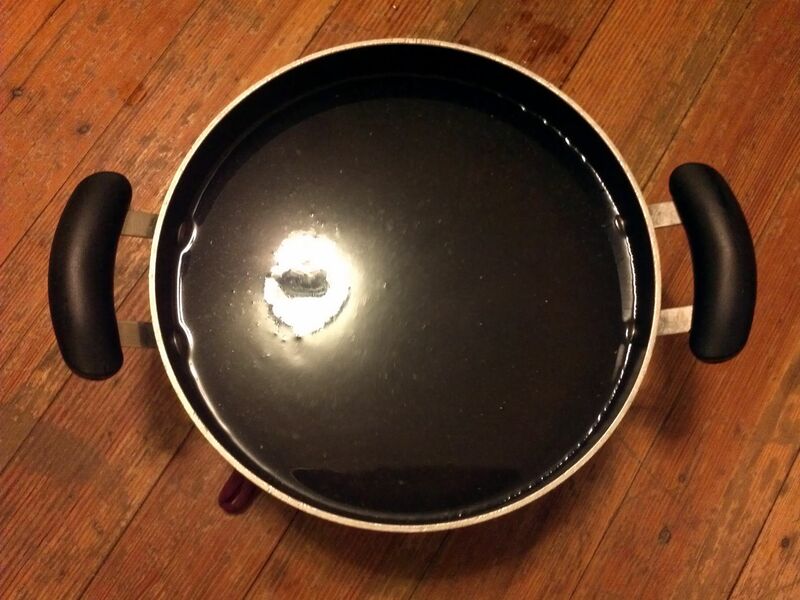 If you just measured the water level of the turkey from the part 1 guide, reuse that water here. The next part needs to be thought out carefully. The turkey, or turkey’s in this case, need to be refrigerated for 24 hours before cooked. 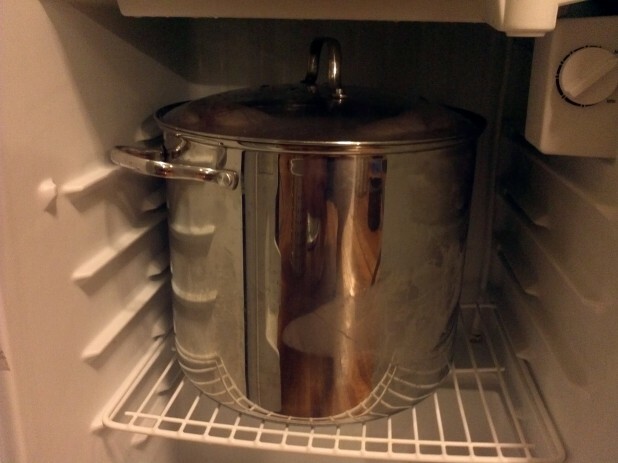 You have both the need for a gigantic pot for fitting the turkey but it also has to fit into your refrigerator. One option is to just use the pot that comes with your turkey fryer kit but often that is too tall to fit in a reasonable refrigerator. 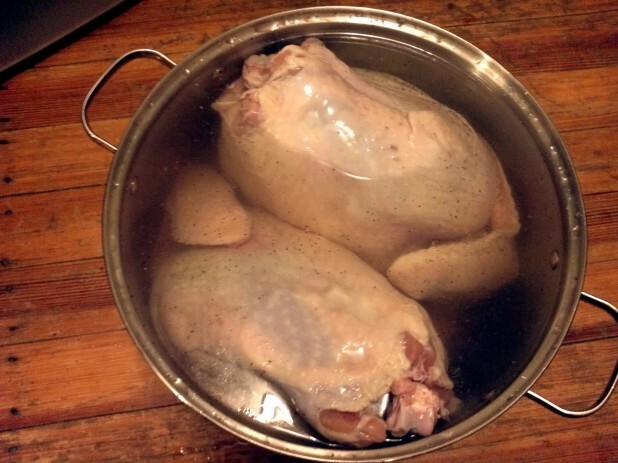 Instead I used my 20 Qt pot that actually fit both turkeys. In case you are wondering, I got two turkeys because I figured the first one would get consumed at the Friendsgiving and then I could eat the second one as inexpensive leftovers the rest of the week. 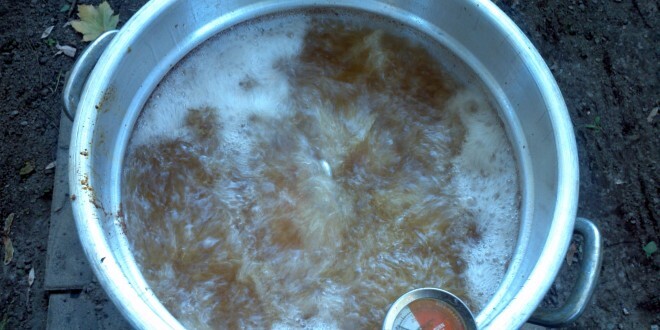 Might as well fry more turkey while you’ve got it setup! Here is the finished turkey brine and turkey’s in the fridge. Note: Make sure you measure the empty container in the fridge before you fill it! Make sure it will fit! This is the end of the second part of the Caveman Keto Turkey Frying Guide. Let your turkey sit refrigerated in the brine for 24 hours and then come back tomorrow for the final steps!